Who needs a Valentine when you’re so good at loving you? If you’ve got plans for treating yourself, let me be your guide. I love the monogram bags and pouches from Madewell. This crossbody bag is especially great because it has several pockets, a built-in mirror and a removable strap to make it a clutch. Perfect day to night piece. Best of all, everyone will know you bagged it once it’s adorned with your beautiful monogram. This Mara Hoffman Geo surf suit provides super stylish rash guard coverage. Add your wide brimmed hat and attend the beach worry free! This is playsuit perfection. Need I say more? Oh, get it before it’s gone. As with most spring/summer 2015 trends hitting the masses right now, 60s and 70s style sunglasses are hot! These Quay Kensie round sunglasses fit the bill. This adorable Stella & Dot bangle, with love inscribed in English, French, German, Italian & Spanish, is the perfect addition to your arm party. Inspiration Bangle – Love, www.stelladot.com, $49. The “mosaic blue” of these D’Orsay suede pumps is so sweet I could eat them. Wear these with everything. Don’t forget to spray them before you leave the house. And finally, this eye cream from Rodan & Fields is a very personal recommendation from me. I’ve used this day and night for a year, and I love it. The holiday season is here, and social calendars are in full swing! It’s so much fun to get dressed up for a night out, and finding the perfect look is key to perfecting my joy. 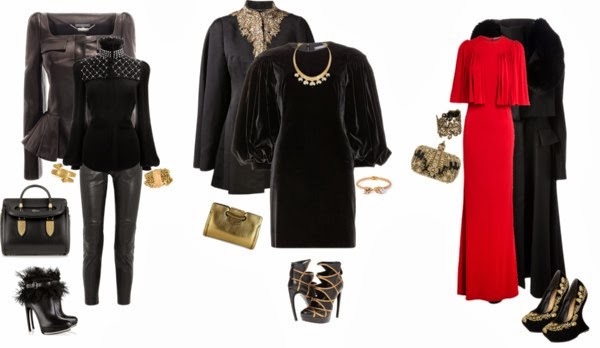 Black-tie optional means a cocktail dress is perfectly appropriate and the same goes for a long gown, which makes the possibilities endless and the decision even harder. I really wanted to keep my entire look under $300 so I’m planning to wear jewelry I already own and hopefully shoes too. Many of the shoes below are just eye candy, as most people own go-to metallic or black pumps for special occasions such as these. And great news, dresses are on sale! This is the cutest Ted Baker Snake Embossed Neoprene dress, perfect for a cocktail party or black-tie optional (or black-tie, according to some). You can find this dress at Harrods. The current price is $258 USD. Obviously, these Christian Louboutin Mea Culpa Flared Suede Pumps are HOT! If you can do it at $895 per pair, then do it! Husband or Santa, if you’re reading this, I wear a size 38. And my go-to, fancy-wear Stella Casablanca earrings to finish the look. Halston Heritage Plunging Gathered-Waist Jersey Gown. This dress didn’t drape right on me, and made me feel hippy. It’s a gorgeous choice for someone though, and it’s now on sale at Neiman Marcus for $237! I went with vintage-looking Naomi cluster earrings and Zora crystal necklace up top and Kristin Cavallari Copertina Lt Gold Glitter Pumps down low. A Diane von Furstenberg Draped Satin Jersey Gown. Is there a theme here? Yes, I’m obsessed with a beautiful, plunging neckline, long-sleeved dress. And I’ll admit, my closet is pretty dark in general, with navy and black being my favorite colors to wear. This was a contender for me, even though it’s completely see-thru (this is what slips are for, right?). It draped perfectly and would have been stunning with this Stella & Dot Casablanca necklace and Vintage Crystal Studs I already own. The DVF gown is on sale at Saks Fifth Avenue for $317. This Piperlime Collection Embellished Dress is great for showing off your legs! It was a little too stiff for me and not my favorite silhouette to wear, but I tried! You can find it at Piperlime for $109. This Black Halo gown is the first dress I tried on. Not only was it over budget, but it looked terrible on me! Too bad, right? Because it’s so pretty. If the sky was the limit, I would be wearing this look. This Kenzo Twill Mountain Dress is to-die for! But at $965, it didn’t meet my budget for this event. I added a REISS belt to it because fit and flare is better for me when the waist is belted, just a personal preference. And look at those shoes! Love, love, love these Consuelo Calfhair Ankle Wrap Pumps by Ivy Kirzhner, currently on sale for $258 at www.lastcall.com! Hurry. And Kate Spade stud earrings and a couple of bangles too finish the look. This is the Bloomingdales Boutique Gown (now on sale for $223) I chose. Really, from the beginning, I wanted to wear a long gown with long sleeves. I love the beading detail around the neckline and keyhole, and it fit perfectly (aside from drastic hemming). I also had the little train removed because I think it made it a little too formal and there is nothing more annoying than people stepping on your dress all night. The beading shows up a little silver and gold in this photo, but it’s actually all silver & platinum looking. I finished the look with jewelry I already own (whoop!) from Stella & Dot, Casablanca earrings with the bottom piece removed, the Casablanca bracelet and the Deco Cocktail Ring. I’m thinking of doing a faux bob for the occasion and polishing the look with bright red lips and nails. I know I’m wearing a 4-inch heel, but shoes are still TBD, although these Caparros peep-toe heels would be a great choice, and are on sale at Lord & Taylor for $60. Planning an early summer getaway in the mountains? I’ve got you covered. Here’s what I plan to pack for Park City in early June. With highs in the upper 60s and lows in the upper 30s, long sleeves and light sweaters will be key for comfortability. It’s likely I won’t be packing all the bags below, but two or three for sure! In my dreams, my closet is full of Alexander McQueen. I’m also 6 feet tall with a 24″ waist, but let’s talk about what could actually happen if money grew on trees. 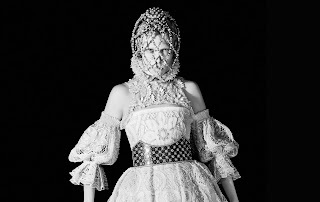 Alexander McQueen is at the very top of my fashion bucket list. From gorgeous, floor-length gowns to coats and jackets for every occasion to ornately detailed shoes, handbags and jewelry, this iconic label produces show-stopper after show-stopper, and I want it all, even my head in a cage.